Josh Laboratorie: Thank you: November and one more month. Thank you friends for following me on facebook, blog and twitter. I have seldom send invites to my page, as I believe that art sometimes need to speak for itself. I'm currently at the last phase working on a small picture book, which I hope to reveal before Christmas. It'll be my first illustration book and hopefully, not the last. I am continuously exploring new ways to create art pieces, while at the same time seek to improve every stroke. Untill then, thank you for continue to support this page, i hope to fill your timeline with more amazing artwork. 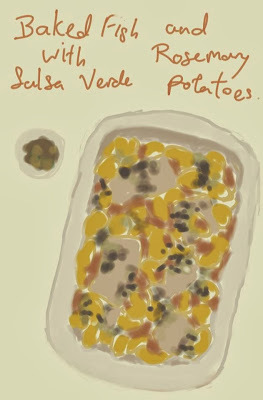 Image: painted this morning while communting to work - Baked Fish with Salsa Verde and Rosemary Potatoes, recipe from Delicious magazine.